Yesterday, rumours were swirling on Twitter that the next poll from Forum Research would show Rob Ford in the lead in the Toronto mayoral race. The rumours were half-right, at least according to the tea leaves of the poll published by the Toronto Star this morning. Apparently, in Forum's two nights of polls on August 25 and 26, Ford was in a "statistical tie" with John Tory on the first night. Combine that with the rumours, and that probably means Ford was ahead on that first night. Note: the averages here remove undecideds from the equation, so that is why the results and the recent-highs/lows are somewhat different from what Forum has reported. Forum has not removed undecideds from its polls. I took a look at this poll in detail for The Huffington Post Canada. Because of the waves the poll is likely to make today, I thought it worthwhile to highlight the piece here rather than post about a different topic entirely. I found a few issues with the results of the poll that might lead one to think we're looking at a blip that will be reset with the next poll. Regression to the mean and all that. Now, one might accuse me of setting out to find reasons to doubt the poll. Those accusations would be completely accurate. Whenever a new poll emerges that shows something unexpected or at odds with what other surveys have shown, those of us who look at these things have a responsibility to investigate whether the poll itself is the reason rather than to look for explanations in the real world first. Are these results terribly unusual? Not exactly - Ford is up four points among all voters, five points among decided voters. Significant but not unworldly. 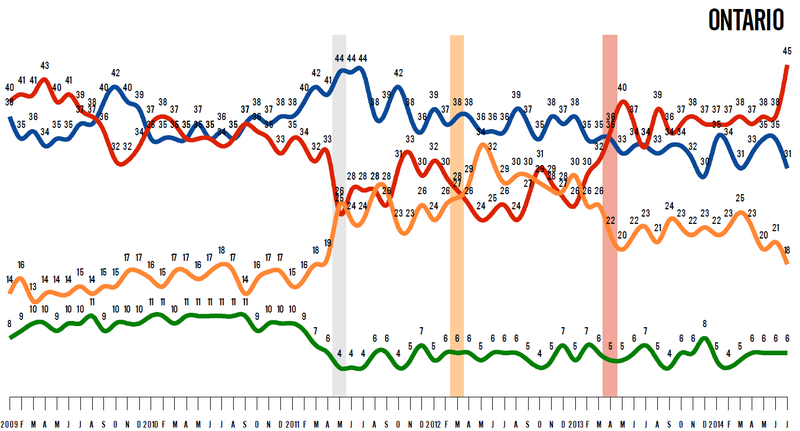 While Tory has led in the last few polls now, he hasn't run away with it, and Olivia Chow appears to be dropping. This is also the first poll since Karen Stintz withdrew from the race. It is perfectly rational that a candidate might make a move in these circumstances. But Ford is not the candidate of rational politics. I can say with confidence that Canada has never seen a political figure like him before - at least one that actually stands a chance to be re-elected to high office. We all know what he has been alleged to have done, denied having done, was confirmed that he had done, has apologized for what he has done, and what he has done again to restart the whole cycle. That he could win is counter-intuitive, so we must investigate reasons for a surge in support in the poll itself before assuming enough Torontonians are willing to give him another chance. The next polls will determine whether Ford has indeed put himself back into a position to potentially be re-elected. For now, we should proceed with caution. After a long drought of polls, two new ones were released yesterday. One, by Forum Research for the Toronto Star, I looked at for The Huffington Post Canada. The other, by CROP for La Presse, is the one we'll focus on here. And it is an interesting one. The latest missive from CROP pegs Liberal support to stand at 38% in Quebec, up six points from CROP's last poll of June 12-16. That has moved them into first place, ahead of the New Democrats who were down three points to 32%. The Bloc Québécois, in the midst of internal turmoil as Jean-François Fortin leaves the party and Claude Patry confirms he will not run for re-election in 2015, dropped five points to just 13%. Though Nanos Research has had the Bloc below 13% on several occasions over the last few years, this is the lowest a Quebec-based polling firm has put the Bloc in recent memory. In all likelihood, this is the lowest the party has ever been since it was founded in 1990. What is the opposite of a honeymoon? Whatever it is, that is what new leader Mario Beaulieu is experiencing. The poll asked Quebecers whether they felt the Bloc was still pertinent, and 65% of them said it wasn't. But worse is that 44% of sovereigntists agreed. Considering that Beaulieu has opted to focus on independence above all else, that is a crushing rebuke from the very people he is supposed to be firing up. More respondents said they would consider voting for the Bloc if it reverted to its traditional role of defending Quebec's interests. The Bloc's drop of five points is outside the margin of error (or would be if this was a probabilistic sample) and is part of a recent trend of Bloc weakness. Of the eight polls conducted since Beaulieu won the leadership race, the party has been pegged under 20% in all but one of them. Prior to that, we have to go back 23 polls (to January) to find seven that has the party that low. Perhaps most embarrassingly for the Bloc, which has run in the past on being able to 'block' the Conservatives, the party was just one point up on the Tories in Quebec. They were at 12%, up two points, while the Greens were at 5%, up one. The Bloc's support among francophones dropped dramatically, down six points to just 17%. The Liberals were the beneficiaries, up 10 points to 34%. That helped them close the gap on the New Democrats, who were in front at 36%. Among non-francophones, the Liberals led with 53%, followed by the NDP at 18% and the Conservatives at 16%. That was double their standing in June, however. The Greens were also up big, by nine points to 14%. On the island of Montreal, the race was tied at 37% apiece for the Liberals and NDP, representing a 14-point gain for the latter. The Conservatives were third at 11%. In the suburbs around the island, the race was also close: 33% for the Liberals vs. 32% for the NDP. The Bloc was third here with 16%. The Liberals made a big jump in Quebec City, gaining 14 points to lead with 33%. The Conservatives dropped to 30%, while the NDP was down 15 points to 22% in the provincial capital. And in the rest of the province, the Liberals were ahead with 44% to 32% for the NDP and 15% for the Bloc. In terms of seats, the province-wide model gives the New Democrats 46, with 27 going to the Liberals and five to the Conservatives (the Bloc Québécois would be shutout). But, as I've discussed before, province-wide models in Quebec may not do the job well as the Liberals have gained support disproportionately outside of Montreal. Taking that into account, there are another eight seats that could fall to them instead of the NDP, narrowing the gap to 38 seats for the NDP and 35 for the Liberals. On who would make the best prime minister, Justin Trudeau saw a four-point jump to lead with 31%, followed by Thomas Mulcair at 26%. That was a drop of five points. Stephen Harper was at 10%, while Beaulieu tied Elizabeth May at just 2%. By comparison, André Bellavance averaged 3.4% during his interim tenure, and Daniel Paillé averaged 4.3%. 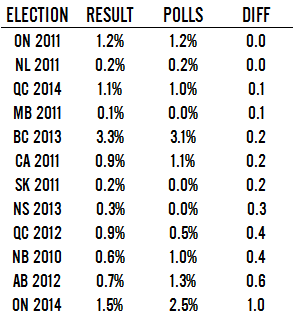 Back between 2007 and 2009, Gilles Duceppe averaged just under 20% in polls by Nanos. The question that will only be answered in the coming weeks and months is whether this is a blip for the Bloc or the first sign that the party will not be able to hold on to any seats in 2015, which would be the final nail in the party's coffin. The Bloc was not en route to a triumphant return under Paillé, but he did have enough support to hold his seats and perhaps win a handful more due to vote splits. Under Beaulieu, it seems that the Bloc may not be able to hold onto the majority of its seats even before the election begins. One would expect the NDP, the party that benefited from the Bloc's downfall in 2011, to take advantage. But CROP, at this stage, gives the nod to the Liberals. Will that hold? The riding of Waterloo will be contested for the first time next year, created out of the former Kitchener-Waterloo riding currently represented by Conservative MP Peter Braid. The riding has an interesting history, and was once the seat of a future prime minister. The riding also has deep German roots, going back to the days when Kitchener was known as Berlin. This is the second riding whose history I am profiling as part of the 2013 Kickstarter campaign. This riding was requested by backer Anthony Piscitelli, who generously contributed to the project that led to Tapping into the Pulse: Political public opinion polling in Canada, 2013. The ebook can be ordered here, or directly from Gumroad here, Amazon for your Kindle here, or from Kobo here. 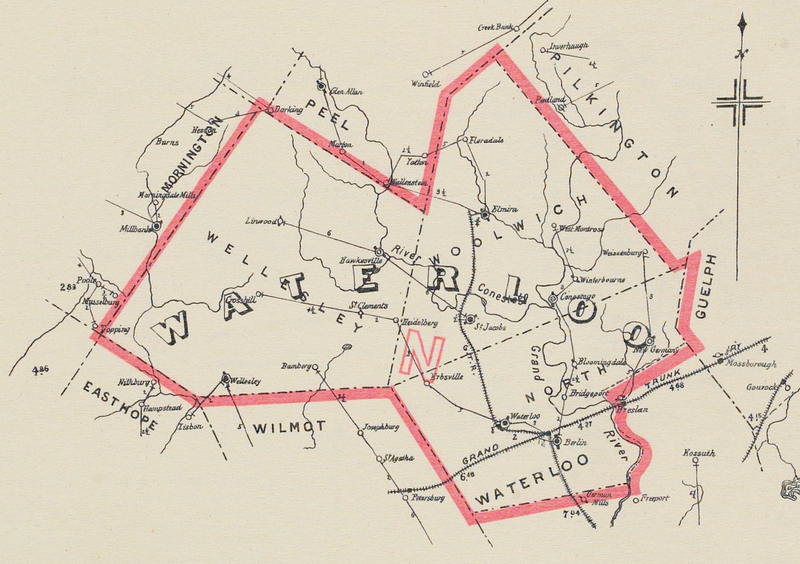 The riding of Waterloo began its history as the riding of Waterloo North, which included both the cities of Waterloo and what would later be Kitchener. The riding was only first contested, however, in 1878. "Assuming that we are laying the foundation of a British North American Empire, which is destined to become independent of the Mother Country, after our resources may become sufficiently developed, and our vast territory has been filled up with an industrious, intelligent, and thrifty population, I do not think such anticipation should induce us to vote against it." Bowman's first contested election in 1878 was not a successful one, as he was defeated by Hugo Kranz by a margin of 52.5% to 47.5%. Kranz, born in Lehrbach, Germany, and mayor of Berlin (Ontario) from 1874 to 1878, would be re-elected in 1882 by an even slimmer margin. 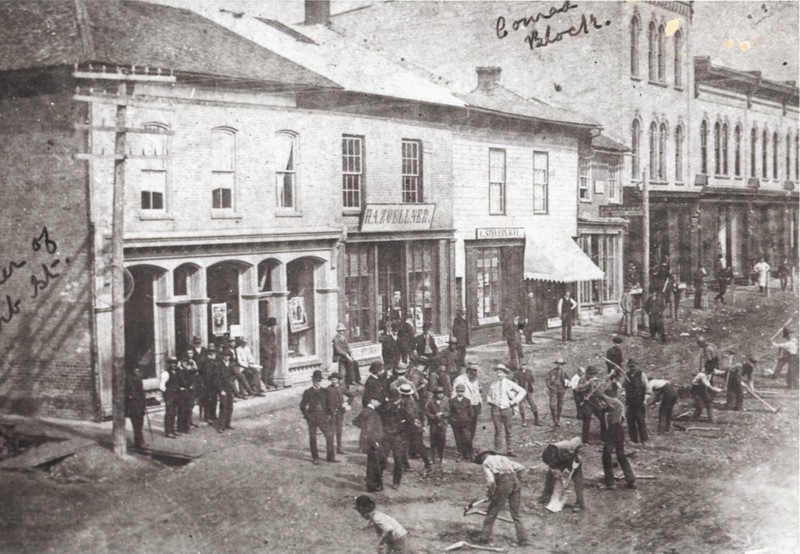 But in 1887 Bowman made a comeback and ousted Kranz, defeating him again in 1891. Bowman did not run for re-election in 1896, and died a year later. The obituary in the Berliner Journal read that "with firm decisiveness in political matters, [Bowman] combined proper treatment of his opponents in elections, along with modest simple, friendly behaviour in person relations, and was, consequently, loved and respected by all classes." In 1896, Conservative Joseph Seagram won the riding. A breeder and distiller and former councilor for Waterloo, Seagram was well-known in the horse racing community and would be an inaugural inductee into the Canadian Horse Racing Hall of Fame in 1976. The founder of Seagram's, a maker of whiskey and other beverages that was sold off in 2000, Seagram's horses won 15 Queen's Plates. He was acclaimed in 1900, and won again in 1904. He did not run for re-election in 1908. That year, the riding was won by William Lyon Mackenzie King. The future leader of the Liberals from 1919 to 1948, King would be prime minister from 1921 to 1926, again from 1926 to 1930, and yet again from 1935 to 1948. But as the MP for Waterloo North, King was named Minister of Labour and was acclaimed in a by-election following that appointment, as was the convention at the time. 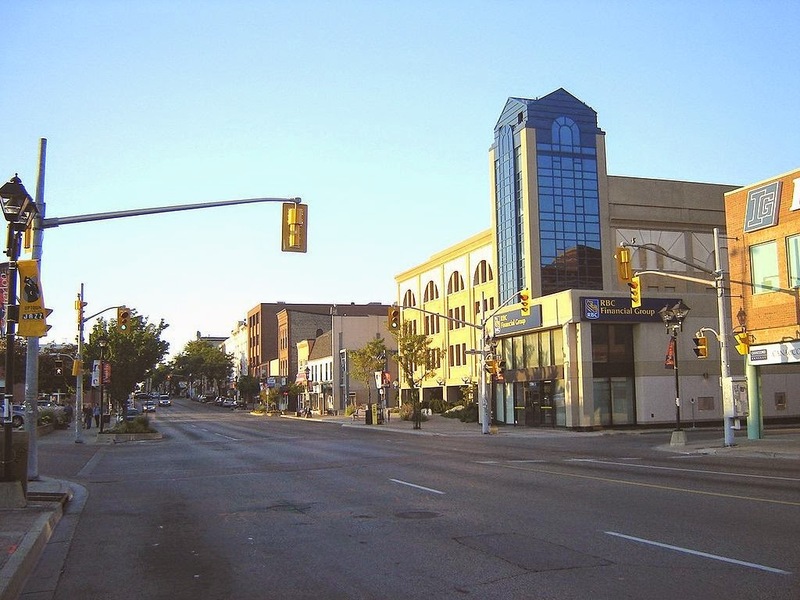 King would not call Waterloo North home for very long, as he was defeated by a margin of 52.2% to 47.8% in the 1911 election that saw Robert Borden's Conservatives come to power. King would later represent ridings in Prince Edward Island, elsewhere in Ontario, and in Saskatchewan. William Weichel defeated King in 1911. A merchant, he would later be the MPP for Waterloo North and mayor of Waterloo. But Weichel would prove to be but a brief interlude in a long period of Liberal reign. Undoubtedly as a result of the First World War, the heavily German riding of Waterloo North swung to the Liberals in 1917 by a large margin. 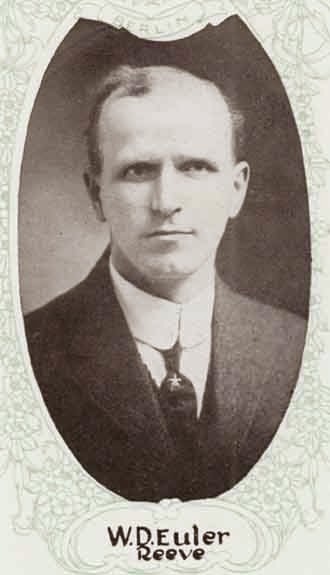 William Daum Euler, who would be re-elected seven times and be Waterloo's longest-serving MP, took 59% of the vote in the 1917 election. Mayor of Berlin from 1913 to 1914, Euler had spoken out against anti-German sentiment at the outbreak of the war. That sentiment was so strong, of course, that Berlin would change its name after Lord Kitchener, who was then the Secretary of State for War in the British government. Euler was re-elected in 1921 with a smaller margin, and again in 1925 and 1926. He was then appointed Minister of Customs and Excise, and would later become the Minister of National Revenue in 1927. In 1930, Euler won by his closest margin (57% to 43%) against Karl Homuth, who would have more success as the MP for Waterloo South over four terms. After winning by the largest margin he would manage in 1935 (63% to 20% for the Conservatives and 16% for the new CCF), Euler was named Minister of Trade and Commerce in 1935. After winning again in 1940, just in time for his second war as an MP for Waterloo North, Euler was appointed to the Senate by Prime Minister King. He would sit there until 1961. In total, Euler would serve for 43 years in the House of Commons and Senate. Manufacturer and former mayor of Kitchener, Louis Breithaupt, replaced Euler as the Liberal MP for the riding, winning a by-election in 1940 handily. He would be re-elected again in 1945 and 1949 (when the CCF hit its highest level of support in Waterloo North at 22%), before being appointed to be Lieutenant-Governor of Ontario. In the by-election of 1952 to replace him, Liberal Norman Schneider prevailed with 44% of the vote against 39% for the PC candidate. She was Elizabeth Janzen, a secretary and the first female candidate to run in the riding. Schneider was a business executive, industrialist, and manager, and served in the 118th Battalion during World War I. Schneider would be re-elected in 1953 and 1957. He was defeated in 1958, however, as the PCs took back the riding for the first time in 41 years in grand style, winning 55% of the vote against 34% for Schneider. It would be, until 1984, the best performance of the party in the riding's history. O.W. Mike Weichel, another veteran of the First World War, would be re-elected in 1962 and 1963. In the 1962 election, the New Democrats had their first run at the riding, capturing 16% of the vote. Weichel did not seek re-election in 1965 and Keith Hymmen took it back for the Liberals with 46% of the vote. Hymmen, a chemical engineer and former mayor of Kitchener, would transfer over to the riding of Kitchener when the boundaries were changed for the 1968 election. At that time, Waterloo North became Waterloo. Max Saltsman, formerly the NDP MP for Waterloo South since 1964, transferred over to Waterloo. It had become a better riding for the NDP, and Saltsman won it in 1968 by the closest of margins. The former alderman for Galt, who served in France, the Netherlands, and Germany with the Royal Canadian Air Force in World War II, took 34% of the vote. The Liberals took 33.1% and the PCs 32.5% - a razor-thin three-way race. Saltsman won with a more comfortable margin in 1972 and again in 1974, when Waterloo briefly became Waterloo-Cambridge. In 1979, Saltsman did not run again and the boundaries were changed, the riding reverting to Waterloo. With Saltsman gone and the boundaries shifted, the NDP fell to 18% and the PCs took it. Walter McLean, a Waterloo alderman and former chaplain with the RCAF's 404 Wing, McLean would be re-elected by a slim margin in 1980 and more comfortably during the Brian Mulroney years in 1984 and 1988. He served as Secretary of State from 1984 to 1985, and Minister of State (Immigration) until 1986. McLean did not run in the 1993 election and the Liberals stormed back with 48% of the vote, their best performance in 40 years. Andrew Telegdi took the riding, as a Reform Party candidate finished seond with 26%, just edging out the PCs with 24%. 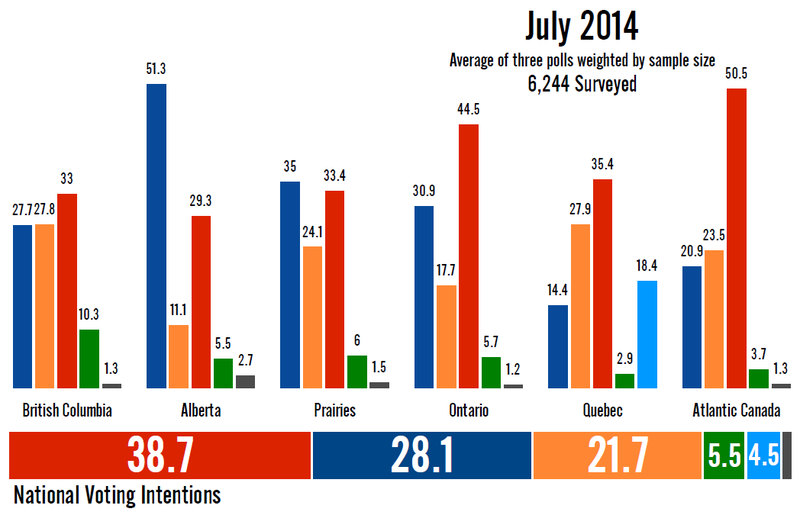 The NDP sunk to its lowest level of support at just 4.5% of the vote. Telegdi was re-elected in 1997 when the riding became Kitchener-Waterloo, and the PCs moved back into second place. He was named Parliamentary Secretary to the Minister of Citizenship and Immigration in 1998, and was re-elected in 2000, as the Canadian Alliance moved into second, and again in 2004 against the re-united Conservatives. He was named Parliamentary Secretary to the Prime Minister with special emphasis on Aboriginal Affairs in 2004, and was re-elected in 2006 as Stephen Harper's Conservatives took power. In 2008, however, Telegdi was defeated by a margin of just 27 votes. With 36.1% of the vote to 36% for Telegdi, Peter Braid had just squeaked by. The Greens put up their best performance in the riding in their history, with 12%, coming not too far behind the NDP's 15%. Braid's margin widened somewhat in 2011 (41% to 38%), and the MP has been Parliamentary Secretary for Infrastructure and Communities since 2013. The riding has moved away from its German roots (Waterloo North had only two MPs who were not of obvious German descent - King and Seagram) but is still quite Liberal. The riding has been won 22 times by the Liberals in contested elections, and the party has averaged 46.8% support since 1867. That compares to 14 wins and 39% for the Conservatives and their predecessor parties. Kitchener-Waterloo was one of the better ridings for the Liberals in the disastrous 2011 campaign. Though it was, elsewhere, the worst election for the Liberal Party in its history, the 2011 result in Kitchener-Waterloo was better than its performances in the 1970s and 1980s, and was actually even an improvement over 2008. Waterloo began its history as a Liberal riding, briefly flirted with the Conservatives at the turn of the century, and stuck with the Liberals for decades after the First World War. It was 40 years after the end of that conflict before the Conservatives were able to win again. But after the re-drawing of the boundaries in the 1960s, the riding went with the NDP or the PCs for 20 years, never having voted for Pierre Trudeau or John Turner. A safe riding during the Jean Chrétien years, will Waterloo return to the Liberal fold in 2015? As we approached the summer, it appeared that things were improving for the governing Conservatives. They were no longer routinely scoring under 30% support and had closed the gap with the Liberals enough that they could plausibly hope to win the most seats in a new election, even if they finished second in the vote count. But the two most recent polls - one by Forum putting the Tories at 28% and the other by EKOS showing them at just 25.6% - hint that the Conservatives may have taken a step back. The question, though, is whether this is a product of which companies are in the field or if it is something real. New numbers today suggest it might be something worth keeping an eye on. Every week, Nanos Research releases its Nanos Party Power Index, derived from an amalgamation of various questions. I'm not a particular fan of indices like these because it is impossible to compare the results to anything tangible, but two of the questions included and reported by Nanos are revealing. They are on whether respondents would consider voting for a party, and who they prefer for prime minister. On both of these measures, the Conservatives are dropping. The latest set of data, out of the field on August 8, put Justin Trudeau ahead with 30.6% of Canadians saying they prefer him to be prime minister. That was up 1.6 points from last week's monthly-rolling poll. Stephen Harper was second with 26.4%, down 2.3 points since last week, while Thomas Mulcair was at 18.6%, down 1.2 points. But it is not the weekly back and forth that is of note here. 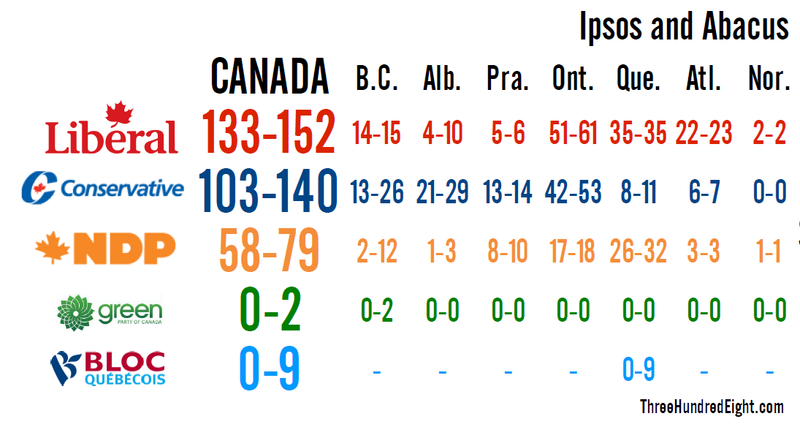 Trudeau's numbers have been wobbling up and down for some time now, but Harper's have been decreasing consistently. Trudeau's 30.6% is only slightly higher than the 12-month average of 29.6%, but Harper's 26.4% is quite a bit lower than the 12-month average of 28.6%, and it has been falling. Four weeks ago, Harper was at 31.1% on this question, near his 12-month high of 32.4%. But that dropped to 30.8% the next week, then 30.3%, then 28.7%, and now 26.4%. In this are we seeing what Forum and EKOS have recently recorded? On whether respondents would consider voting for a party, the Conservatives have also slumped significantly. Over the last 12 months, they have averaged 39.6% - exactly the share of the vote they captured in 2011. Four weeks ago, they were at 43.2%, just down from their 12-month high of 44.1%. But they have since fallen to just 37.6%. That is a very low ceiling for the party and even if they captured all of those votes a majority government would be unlikely. It is an especially low ceiling considering that the New Democrats sit at 42.9%, slightly above average for the last year, while the Liberals are at 53.9%, well above the average. That is a lot of leeway for the Liberals and NDP - they have plenty of room for growth and each could, potentially at least, win more than enough to form a big majority government. The Conservatives, on the other hand, have alienated a large section of the electorate and this limits their ability to win. We will have to wait and see whether other pollsters will confirm the recent weakness in Conservative support. It was not too surprising to see it from EKOS (which often has the Tories low) or Forum (which often has the Liberals high), but Nanos tends to tack towards the middle and the evidence is mounting. It could be that this is indeed a cruel summer for the Conservatives. As the next provincial election in Newfoundland and Labrador will occur within 12 months of the Progressive Conservatives finding someone willing to take on the job, the province might be the next to go to the polls after New Brunswick in September. The latest survey from Abacus Data for VOCM suggests that the Liberals are well positioned to win when that vote comes. The Liberals led in the poll with 48% support, down one point from when Abacus was last in the field at the end of January. The Progressive Conservatives were unchanged at 34%, while the New Democrats were up one point to 16% support. Voting intentions look rock solid on the Rock, as they have hardly budged since last fall, and these numbers from Abacus are well within the ballpark of the Corporate Research Associates' last two polls. The poll reveals that roughly one-third of people who voted for the Tories and New Democrats in 2011 have gone over to the Liberals, and among Newfoundlanders and Labradorians over the age of 60 the Liberal edge extends to 57% to 29% for the Tories. There are only slight regional variations throughout the province, with the Liberals enjoying a large lead everywhere. On the Avalon Peninsula and in St. John's, the Liberals stand at 47% to 34% for the Tories and 19% for the NDP. In the eastern and central parts of the province, the Liberals have 48% support to 37% for the Tories and 10% for the NDP. And in the western end of the island and in Labrador, the Liberal lead is the largest at 52% to 30% for the PCs and 16% for the NDP. The Liberals should be able to win about 26 seats with these numbers, with the Tories taking 17 and the New Democrats winning five. But even these numbers flatter the two other parties, as the Liberals have made serious inroads in Avalon and St. John's, regions where the party took a tiny portion of the vote in 2011. If an election were to be held tomorrow, everything would point to a big Liberal victory. All of the fundamentals are in their favour. Fully two-thirds of Newfoundlanders and Labradorians say they would consider voting for the party, whereas the ceiling for the Tories stands at 52% and that of the NDP at just 39%. This shows just how far the NDP has fallen. Between mid-2012 and mid-2013, the party actually had around 35% to 40% support. Now, that portion of voters will go no further than consider the NDP as an option. Of those who thought healthcare to be the top issue facing the province (29%), the Liberals were seen as the best party to tackle it by 39%, against 24% for the Tories and just 8% for the NDP. On the question of the economy and jobs, usually an election-deciding issue, 42% of those who considered it the top issue felt the Liberals best able to handle it, compared to 33% for the PCs and 7% for the NDP. The most lopsided result for the Liberals, though, was among those who considered government accountability and leadership to be the top issue. The party was the choice of 48% of the 10% of respondents who had selected this as their major concern, followed by the PCs at just 13%. The governing party has taken a huge credibility hit, even if it is still relatively competitive on the question of the economy. Abacus says there will be leadership numbers out tomorrow. Dwight Ball has polled very well in other surveys by CRA and Angus Reid, so we should expect to see something similar in the next report. What would be interesting would be some figures on the PC leadership race, one of the oddest races in recent memory considering that we are now in Round 2 with a whole new cast of characters. It could be a close race. Paul Davis has 12 caucus supporters to date, according to the current Wikipedia tally, with a combined total of 24 election wins under their belts, while John Ottenheimer has seven supporters with 16 election wins and Steve Kent has six MHAs with 13 wins altogether. But will any of them be able to knock Ball from the lead? Maybe we'll get a clue tomorrow, but for now it looks like the next election will be the Liberals' to lose.